Although the term loyal dog doesn’t apply to cats for very obvious reasons, cats are more affectionate than dogs. Cats are moody, yes, but when they take to liking you, they follow you everywhere. 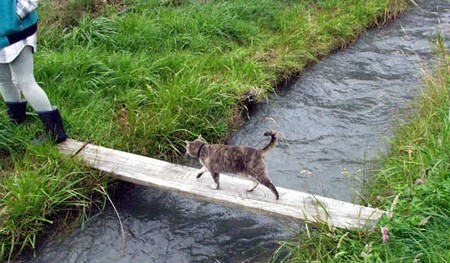 Because cats are nimble and agile, they have no trouble bouncing from one surface to another. Dogs can’t do that. But what makes cats follow us around? Cats are not only sociable, they are also fashionable animals– no offense to dog lovers. Domesticated cats tend to form cat communities based on shared love and food. This group is pretty much like a neighborhood. Female cats bond with each other very fast, quite unlike a human neighborhood. And there’s a dominant female that leads the group. Cats, like dogs, are very territorial, and the sexually active male cat has the biggest territory. Male cats are polygamous and they tend to extend dominance over other lesser-willed cat colonies, especially where other male cats are absent. On the average male dominated cat colonies may be 10 times bigger than female cat ruled territories. In more ways than one cats behave like us: they have also a demilitarized zone. There’s neutral space where they can roam freely without risk of getting attacked by fellow cats (stray dogs are an exception, of course). Stepping out of these neutral areas means war. You’ve seen how cats chase one another on your rooftop and round your garden. Cats make you know you’ve strayed too far down the neutral line when they stare hard at you, hiss, and start to growl. If you don’t catch the message, they’d make short bursts of noise, and lunge at you. While cats live together in a community, they fail at social survival skills: they prowl for food alone. Cats use a variety of sounds, sometimes mimicking that of a baby, to communicate with one another. They purr, meow, cry, squeak, and grunt. Cats are very moody: you can’t make them like you all the time. As such they have varying body language signs which you can tell by the way their ears, tail, paws, and body are positioned. The most socially telling parts are the cat’s ears and tails—an upright tail means gracious greeting, it can also tell the cat’s social rank—the more frequent a cat raises its tail the lower the social position—unlike dogs. Your cat follows you around because it feels a connection with you. It is your cat’s means to let you know that he wants you to accept him or her. It’s, moreover, a part of their survival mechanism–in their ancestral memory as primitive tigers, they had always been hunted down and driven away. Cats look up to you as its second mother, even if they’re already old. Way into their adulthood, cats never get over that feeling of being attended to and cared for.